After the excitement of the two EVAs, we got back into our routine work, if you can call it that. This week’s ‘menu’ has featured a lot of science and maintenance. The arrival of Progress 52 on 27 July brought some novelty, which is always welcome. 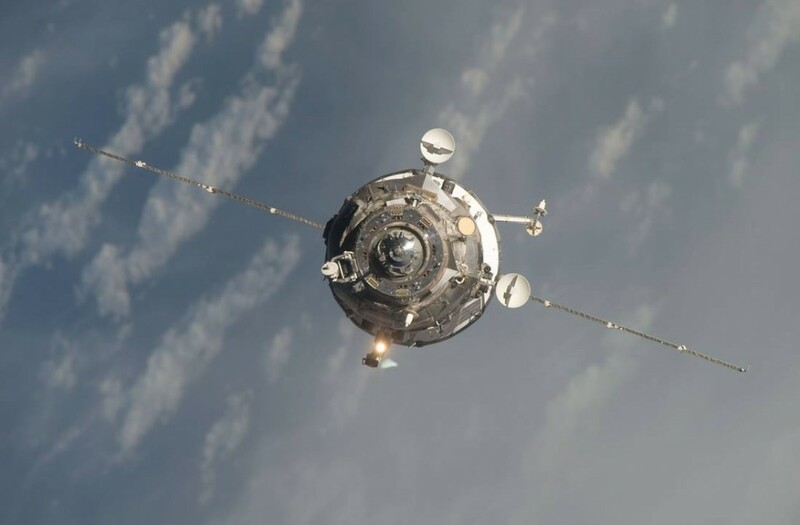 Just six hours after its launch, the vehicle docked automatically with the International Space Station, bringing much needed supplies for both the crew and the Station. Progress is the space transport vehicle for Roscosmos, the Russian space agency. It weighs around 7 tonnes. As usual, we’ve been busy with lots of experiments, some of which are new for me. For the first time since I arrived on the Station, I took part in a telerobotic experiment, which involves operating a remote control robot – NASA’s K10 – located on Earth. It’s a real rover that can move autonomously or according to my commands, which are transmitted from 400 km away. This is an exciting idea that represents the future of exploration: the interaction between an astronaut on board a future spacecraft and a rover on the surface of an as-yet-unexplored planet will be vital, for example, to establishing the conditions for eventually landing safely there. This is the second in a series of tests aimed at creating a sort of ‘intermediate stop’– a strategic point in space from which to direct missions to the Moon. 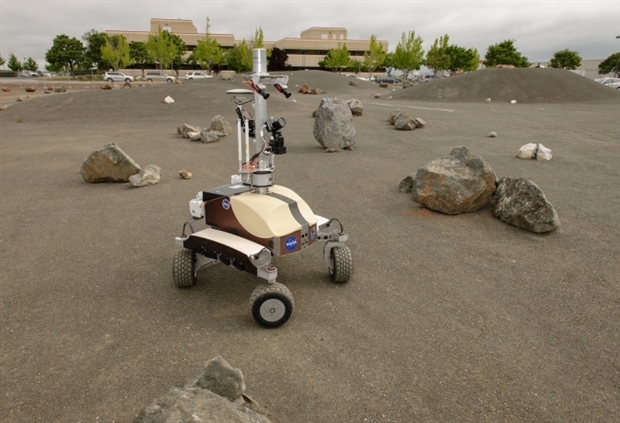 The operative model would include a telescope located beyond the hidden face of the Moon on the L2 point in order to control the rovers on the surface. Recently, I’ve been working a lot in Columbus, especially for Biolab. I’ve also been busy with an experiment that’s about to begin, substituting various components of a combustion chamber that is installed on a rack on board. The chamber will be used to burn special combustibles in completely controlled conditions. 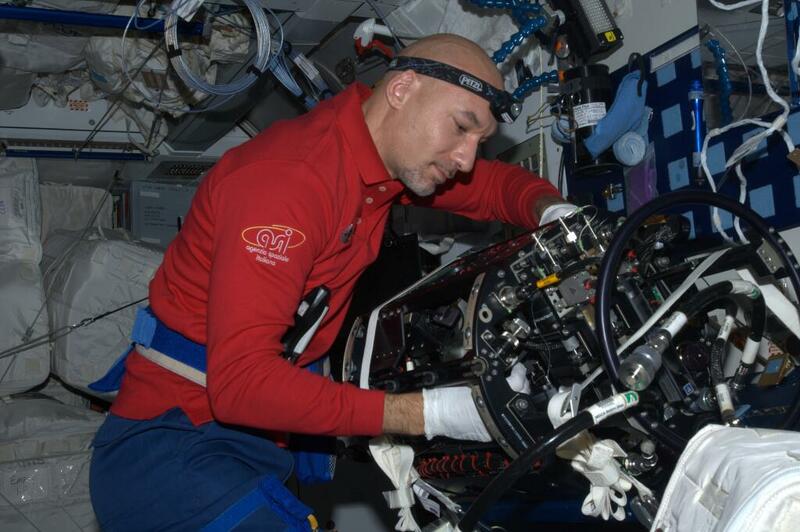 Thousands of daily, weekly and monthly tasks make up our duties as astronauts. It’s really important to dedicate the same effort to each one, from those that could seem less interesting to those that are the most exciting. That makes everything easier. On board the Station, we’ve all got well defined roles and each contribution is key to maintaining this extremely complex infrastructure. I try to enjoy the fact that each and every job carried out here on the Space Station, in this utterly strange and alien environment we’ve adapted to, has its own peculiarity and interest. For example, I spend part of Saturday morning doing the cleaning. You might think that would be really boring, something we do out of strict necessity. But actually, I assure you that with my headphones on and listening to my favourite music, I have loads of fun flying around in weightlessness. The idea of being in such a strange and remote place trying to do such an ordinary activity is really quite intriguing. Of course, in terms of excitement and amazing memories, an extravehicular activity (EVA) is on another level. Those are moments I’ll never forget, and I hope to have more of them. After all, I am an astronaut and that’s my job! At the same time, carrying out extraordinary and important maintenance work as I did two weeks ago in Columbus when I installed the Water Pump Assembly that restored the laboratory to complete functionality – well, those activities give you a great sense of satisfaction. Space is part of our everyday life (even though we rarely realise it). The scientific research we carry out on board the International Space Station is one aspect of this – sadly much overlooked – that has a great impact on life on Earth. The Station is the only scientific research laboratory of its kind, a place for experimenting with the most advanced technology. Technology for exploration, the development of new technologies, material sciences, physics, biology, human physiology, medicine, earth sciences, educational activities, life sciences, etc. There’s something for everyone! Cancer research has been underway for around 40 years but unfortunately, we still haven’t managed to find a definitive cure for this disease. In this field, no one (quite rightly!) expects to find revolutionary results overnight. But when we talk about the science taking place on board the Space Station, the general public has different expectations: instant results! It’s vital to understand that, just like research carried out on Earth, science carried out on board the Station needs time to achieve results. But the impact these results could have in the future – in 10, 30 or 50 years’ time – is impossible to quantify. Skin-B is an experiment studying the aging processes of skin. 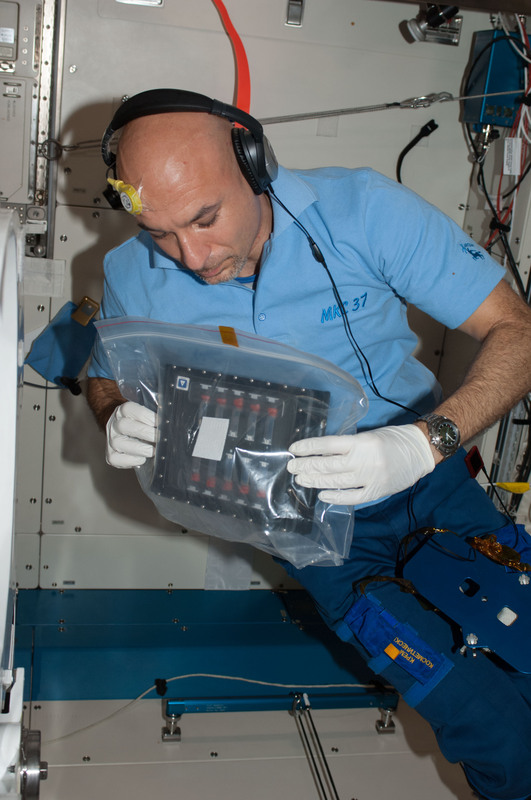 It aims to collect information on the physiology of skin in space because scientists have realised that astronauts’ skin undergoes a rapid aging process while they are in orbit, which is then reversible when they return to Earth. Using specialised tools, I take ultraviolet photos and I measure the surface tension of my skin and the level of water evaporation. Skin-B gathered data on my skin before the launch, it is collecting it while I’m on the Station and it will continue to do so after my mission in order to generate a model of the aging process. This study, which is very specific compared with other scientific activities, will potentially have a great impact back on Earth. Understanding the mechanisms of skin, such as regeneration and aging, could have very practical applications in the fields of dermatology and cosmetics, for example. These experiments, although often unknown to the general public, represent the core business of what we do up here. Unfortunately, we don’t always manage to communicate the importance of these activities because in the end, we are the operators and not the researchers. Another example is an experiment I’ve been carrying out for over a year, which I’ll continue until after my return. It studies the human capacity to maintain high levels of concentration in strange circumstances and in conditions of fatigue and high stress. The Reaction Self Test has a simple piece of software that measures my reaction times just after I wake up and just before I go to bed. It might seem like a very simple study but it forms part of a huge database of information collected over a period of years that helps scientists to understand how our mind can react and remain focused on a task and how this capacity degenerates when, for example, we’re under pressure or we’re tired. This type of research will help experts in the field to improve the procedures that are used every day in special working environments, such as in aeronautics, where pilots work and adapt to nocturnal and diurnal cycles and/or constantly changing time zones. These studies may be less visible, but that doesn’t mean they are less important. A big part of my work is spreading this information, trying to reach as many people as possible. Ciao Luca! Le tue descrizioni e spiegazioni sono veramente chiare e alla portata di tutti. Grazie! PS c’è spazio per il Gioco nello spazio? avete tempo per giocare? non spesso, ma ti assicuro che troviamo il tempo per svagarci durante la giornata. Grazie Luca. con i tuoi resoconti ci fai partecipi di una esperienza per Te unica e con la tua semplicità ci spieghi concetti ed azioni che credo siano estremamente complicati. Buon lavoro e good luck. Molto interessanti le informazioni sugli esperimenti scientifici, i grandi media spesso non approfondiscono preferendo dare spazio a cose piu’ eclatanti. Grazie e in bocca al lupo per il futuro della missione! Grazie, Luca for the amazing information you are sharing on your blog; it definitely creates thought-provoking discussions within our family and we are always trying to spot the station when it crosses the skies above Johannesburg! Auguri & buon viaggio! Cos’è la cosa più divertente che ti piace fare in assenza di gravità, magari quando non sei davanti alla telecamera… (x esempio giocare con l’acqua o con altri oggetti o semplicemente con rotazioni del corpo..)? immobilizzare completamente un oggetto e` praticamente impossibile, soprattutto se piccolo – abbiamo notato che oggetti con una massa elevata sono piu` semplici da stabilizzare. L’aria dell’ISS e` in continuo movimento, per cui tutto tende a spostarsi comunque. Very well written (flawlessly) as always Luca, and very interesting. Again, thank you for taking the time to share your experiences and explain them so well. Grazie ancora e buon soggiorno. per adesso stiamo ancora cercando di risolvere il problema. Non sono a conoscenza di piani per una nuova sortita. hi Luca! thanx for these so well written updates on your activities! Grazie per averci informati del lavoro svolto per noi tutti, (in un film sarebbe chiamata fantascienza ..)una ricerca che apre molte porte e che sicuramente è molto più complessa di ciò che possiamo immmaginare e purtroppo capire ,sennò faremo il tuo lavoro, grazie per aver condiviso e di continuare a condividere ciò che vivi e vedi con noi tutti perchè le emozioni sono e resteranno sempre i veicoli migliori per l’espansione umana in tutte le sue forme..ciao Capitano.. Thank you for sharing your experiences with us – fascinating to read. Your photos are also fascinating and beautiful! Battute a parte… ottimo post, Lù! Che dovrebbero leggere chi ancora (e ce ne sono, credimi) non comprende la figura dell’astronauta, e tutto quello che si svolge sulla ISS. Molti, alla parola “astronauta” associano l’immagine di un individuo con la tuta bianca ed il casco, che vive su un’astronave – a far cosa poi, chi lo sa! – e, ogni tanto, esce a vedere le stelle. Invece tu, in questi 2 mesi, hai fatto un lavoro grandioso: col tuo eccezionale carattere, con la tua dote di grande comunicatore, hai reso comprensibile a tutti quello che, veramente, significa FARE l’astronauta. Uno dei mestieri più complicati in assoluto “da semplificare”, per portarlo alla gente. Arrivare a tutti non è facile, chiaro… ma continua così, perché stai andando alla grande! Grazie, spero di continuare a trovare il tempo per comunicare con il pubblico! Gracias Luca ! por tu detallada explicacion en lenguaje sencillo que permite una fàcil comprensiòn. Envidiable trabajo! Ciao Luca, io ti seguo quotidianamente su facebook dove mi incanto con le tue immagini dallo spazio e che poi distribuisco anche ai mie amici. Devo aggiungere però che al di là della gratificazione visiva ed emozionale, quello che riporti qui, circa la tua attività professionale, è estremamente interessante. E’ il futuro che inizia dal presente. Hai descritto alcune attività che io trovo che possano essere veramente innovative o anche rivoluzionarie. Il k10, la robotica e la telematica per accorciare le distanze ed anche per avere il controllo sulle distanze. E poi l’esperimento sulla sostituzione di vari componenti di una camera di combustione e questo è un esperimento Italiano perché ricordo bene di averlo letto sulla tua pagina di facebook. E poi le “pulizie di casa” per così dire, dove l’assenza di gravità riesce a trasformarle in attività piacevoli o anche ludiche. Poi mi colpisce una tua affermazione molto precisa quando dici che tu sei un operatore e non un ricercatore. Mi viene però da pensare che il limite fra questi ruoli possa essere piuttosto labile, considerato che ” L’ISS è un laboratorio di ricerca scientifica unico nel suo genere, un luogo di sperimentazione delle tecnologie più avanzate. Tecnologie per l’esplorazione, sviluppo di nuove tecnologie, scienze dei materiali, scienze fisiche e biologiche, fisiologia umana, medicina, scienze della Terra, attività educative, scienze della Vita ecc. ecc. ” e qui ho riportato le tue parole. Poi gli esperimenti sulla capacità di attenzione nell’uomo nei tempi diversi fra la mattina e la sera, poi gli esperimenti sulla pelle. Trovo curioso ” l’invecchiamento epidermico di tipo spaziale” per così dire, così come trovo curiosa la sua “reversibilità di tipo terrestre” per così dire. E poi tanto altro ancora, cercare di capire un pò di più sui tanti perché e per come del cancro…..
Ma l’aspetto veramente innovativo è che sia tu che l’equipaggio ci rendiate partecipi delle vostre esplorazioni. La ringrazio delle interessanti domande. Quando sottolineo la differenza tra un ricercatore e un operatore, intendo dire che come operatore non ho conoscenze approfondite degli studi, ma solo un’idea superficiale – in questo senso, mi e` molto difficile rispondere a domande molto specialistiche. dermatologia e cosmetica……potrebbero i vostri test essere cosi’ validi da aiutare a sopprimere l’uso della sperimentazione sugli animali? è davvero lodevole il tuo diario di viaggio..proprio in funzione delle tante mansioni che hai..perchè denota un animo generoso che vuole condividere un suo momento bello..dopo questa prova seguirei il tuo diario anche diventassi un truck driver..hahahah..propago il tuo trip ai 52.000 fa della mia pagina…e spero anche tu abbia il tempo di vedere un po di roma nelle ns foto.. Non vede chi non sa vedere lontano. Vedere lontano vuole dire vedere dal presente, la prospettiva prossima e futura. Mi chiedevo non è che tra un esperimento e l’altro la sera del primo Agosto hai scattato qualche foto alla Svizzera? In occasione della festa nazionale sulle cime delle montagne vengono accesi dei falò, da Terra è molto suggestivo, chissà dallo spazio!! CIAO, LUCA DOBBIAMO RINGRAZIARTI PER LE SPLENDIDE FOTO CHE INVII. 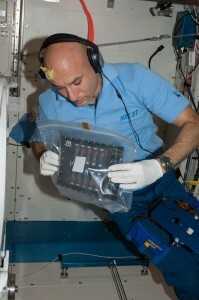 Ciao Luca,guardandoti lavorare fuori dalla ISS,volevo sapere,ma quando usavi i vari attrezzi,riuscivi a sentirli con le mani avendo quei guanti così (sembrano)spessi?Deve essere difficile,svitare , avvitare e fare tutte le altre manzioni,dentro a quella tuta spaziale. Ho la fortuna di vederti passare ,alla sera sempre puntuale, dalla finestra di una cameretta,senza dover uscire. Se ora ,il passaggio,si vede bene,quando cresceranno i moduli,l’ISS sarà più pesante,quindi ,passerà sempre alla stessa altezza? a vedere cose che non vedrò mai,grazie e buon lavoro. grazie innanzitutto per la risposta che mi ha fornito su FB riguardo il ritmo circadiano qualche sera fa. Sono una psicologa ed in passato mi sono dedicata ad una ricerca proprio su questo argomento, approfondendolo a livello dei neurotrasmettitori. Ho letto anche dell’ esperimento Skin-B. Quanti stimoli ci offre Luca, ci fa pensare e sognare nello stesso tempo. 6 mesi non saranno poi così lunghi. Grazie per farci stare con la testa tra le nuvole… Volare.